The Grand Palladium Bávaro Suites Resort & Spa is located in the Punta Cana Resorts complex, and named after one of the most famous beaches on the east coast of Quisqueya. Set on a stunning white-sand beach, the hotel is in complete harmony with the island's beautiful tropical landscape. 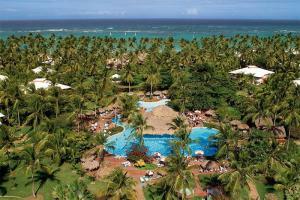 Located just 12 miles from the Punta Cana Airport. La Adelita Restaurant, Tapeo Restaurant, Sumptuori Restaurant, Rodizio Restaurant, La Parrilla Restaurant, Bamboo Restaurant, Mare Nostrum Restaurant.